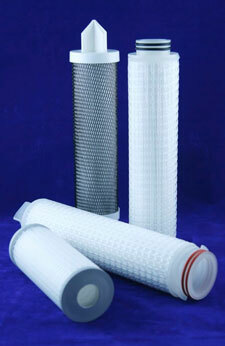 Tec-Pleat DP filter cartridges are absolute rated, pleated polypropylene depth filters. Incorporating up to 8 separate filtration layers with progressively finer ratings, Tec-Pleat DP filter cartridges are particularly suitable for the filtration of fluids containing a wide range of particle sizes. The coarse outer pre-filter media layers remove contaminant that would foul a traditional pleated filter cartridge, whilst the finer inner media layers ensure that the stated filtration efficiency is achieved. Tec-Pleat DP filter cartridges are absolute rated, tested to Beta 5000 using the industry standard OSU-F2 test procedure with AC Fine or Coarse test dust as appropriate. 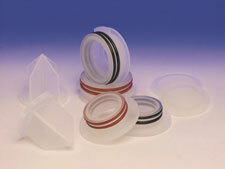 Manufactured from 100% polypropylene filter media and hardware. These filter cartridges have excellent chemical compatibility. Thermal bonded construction eliminates the requirement for adhesives, maintaining product integrity in demanding applications and minimising the level of extractables in the filtrate. Tec-Pleat DP filter cartridges are available in a wide range of length and endcap configurations to retrofit most industry standard applications. Tec-Pleat GP Plus filter cartridges are absolute rated, pleated polypropylene depth filters, they are equally suitable for use as membrane pre-filters or final polishing filters in applications that do not require membrane filtration. Tec-Pleat GP Plus filter cartridges are absolute rated, tested to Beta 5000 using the industry standard OSU-F2 test procedure with AC Fine or Coarse test dust as appropriate. Manufactured in the UK from 100% polypropylene filter media and hardware, Tec-Pleat GP Plus filter cartridges have excellent chemical compatibility. Thermally bonded construction eliminates the requirement for adhesives, maintaining product integrity in demanding applications and minimising the level of extractables in the filtrate. Tec-Pleat GP Plus filter cartridges are available in a wide range of length and endcap configurations to retrofit most industry standard applications. 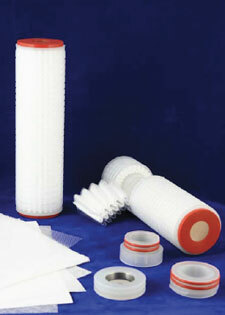 Tec-Pleat GP filter cartridges are cost effective, Beta 5000 absolute rated pleated polypropylene filters. They are fully welded construction, containing no resins, binders or adhesives which makes them particularly suitable for chemical, food & drink, and high purity water filtration applications where chemical compatibility and minimal levels of extractables are crucial. 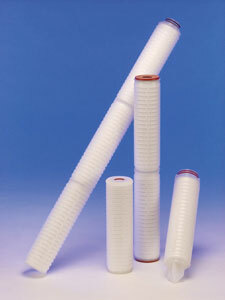 The combination of high surface area and the use of high porosity meltblown polypropylene filter media means that Tec Pleat GP pleated filter cartridges have very low initial differential pressures at high flow rates, and substantially increased service life compared to alternative, low surface area products. A comprehensive range of thermally welded endcaps are available to suit most existing installations. Tec-Pleat PES filter cartridges are microbiologically rated pleated filter cartridge based on a naturally hydrophilic, mirrored asymmetric Polyethersulphone membrane. Tec-Pleat PES filter cartridges have a multi-layer construction, with an integral microfibre pre-filter layer and polypropylene support and drainage layers. The high surface area, 0.6m2 EFA, and integral pre-filter ensures high flow rates with low pressure drops and long service life. PES membranes are naturally hydrophilic so contain no wetting agents, together with the thermal bonding assembly process this results in a cartridge with very low levels of extractables, and when supplied pre-rinsed Ultrapore UPES filter cartridges have fast rinse up times to 18 M2cm. Another feature of PES membranes is low protein binding, meaning that most of the proteins present in the feed remain in the filtrate. Tec-Pleat PES filter cartridges are available in a wide range of length and endcap configurations to retrofit most industry standard applications. Tec-pleat Ultimate filter cartridges are absolute rated, pleated polypropylene depth filters, they are equally suitable for use as membrane pre-filters or final polishing filters in applications that do not require membrane filtration. Ultimate filter cartridges are absolute rated, tested to Beta 5000 using the industry standard single pass OSU-F2 test procedure with ISO 12103 part 1 A2 Fine and A4 Coarse test dust as appropriate. Manufactured in the UK from 100% polypropylene filter media and hardware, Ultimate filter cartridges have excellent chemical compatibility. Thermal bonded construction eliminates the requirement for adhesives, maintaining product integrity in demanding applications and minimising the level of extractables in the filtrate. All materials conform to the relevant requirements of FDA CFR21 part 177. Ultimate filter cartridges are available in a wide range of length and endcap configurations to retrofit most industry standard applications. 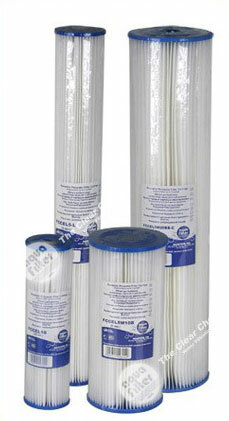 These pleated polyester filter cartridges are manufactured from a fibrous polyester which increases the depth of filter media giving greater dirt holding capacity and increasing service life. The pleat pack ends are fully immersed in a vinyl plastisol end cap which incorporates the sealing gasket and ensures complete integrity of the pleat pack. The high dirt holding capacity and efficiency of this range means that these filters are particularly useful for prefiltration before Ultra violet treatment and in other private water supply duties where long service life is essential. Spun Bond Pure polypropylene spun bonded 1 - 100 up to 50"
Wound Polypropylene, cotton or fibreglass on polypropylene or stainless steel core. Standard 65mm dia or 104mm dia (BB style) No 1 - 150 up to 40"
Pleated Polyester Pleated polyester washable media on a polypropylene core with PU moulded end caps. Standard 65mm dia or 104mm dia (BB style) No 5 - 50 up to 20"
Tec-Pleat GP Absolute rated pleated melt blown polypropylene, length to 40" all end cap variants, extruded polypropylene outer sleeve. One piece design No 0.45 - 50 up to 40"
Tec-Pleat GPP Absolute rated pleated polypropylene pleated cartridge higher area than GP. All end caps. Hard cage . Batch numbered for traceability. One piece design No 0.2 - 50 up to 40"
Tec-Pleat Ultimate Absolute rated pleated polypropylene with 0.8 sq.m of pleated media. Lot numbered for traceability. All end cap options. Modular construction 0.2 - 50 up to 40"
Tec-Pleat PES Absolute rated pleated polyether sulphone membrane cartridge. Integrity testable. Modular construction No 0.04 - 0.65 up to 40"
Tec-Pleat DP Absolute reated pleated depth filter cartridge designed to maximum solids holding. 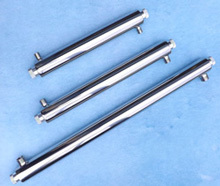 Ideal for gel removal No 0.45 - 100 up to 40"
AWS All welded stainless steel cartridges either pleated format or cylinder wrap. All common end cap configurations No 3 - 800 up to 40"